Every year I buy a big bag of candy conversation hearts and then we eat a few and have tons left over. Last year instead of wasting the candy, we used the candy hearts for making patterns and doing addition & subtraction. We even snuck some reading into our pattern-making too. Since I never got around to sharing this activity last year, I thought I'd share it this year and hopefully this will give you something fun (and educational) to do next week while you are celebrating Valentine's Day. I did this activity three different ways... one way for my (then) 2-year-old and two other ways for my 5-year-old. 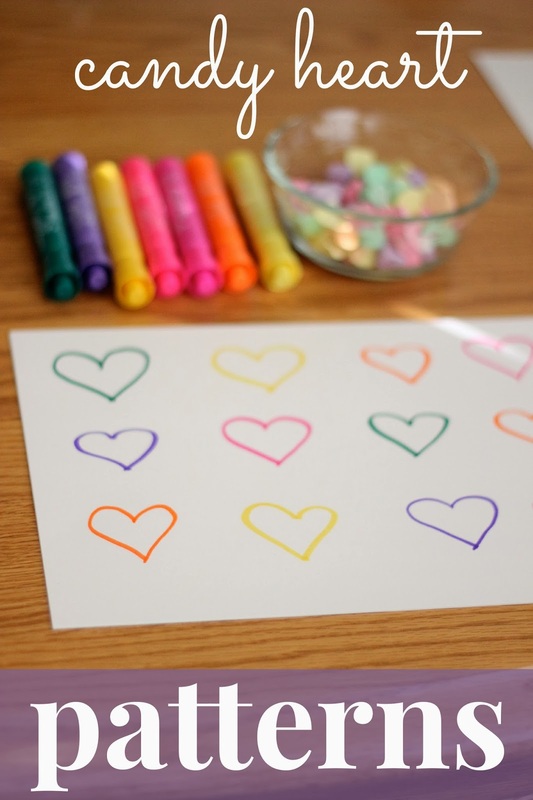 For little ones start by drawing lines of hearts using a variety of colors. Then give your child a bowl of candy hearts and have them match the candy hearts to the correct colored heart. As they match and notice colors you can talk about what you see and any patterns you notice. Next draw several black hearts onto a piece of paper and then give your child candy hearts and colored markers and have him draw his own patterns by coloring in each heart. Then encourage him to match the candy hearts to the heart patterns he drew. Lastly, create a paper covered with hearts and write an alphabet letter inside each heart based on the first letter of the conversation hearts. For example, if one candy heart says 'Be mine" then write a "B" on one heart. I went through and looked at the first letter on about 12 candy hearts and then wrote them on our paper. Next my son read each candy heart and matched the first letter to the letter on the paper heart. We had fun noticing color patterns, letter patterns, and practicing new words. This activity was so simple and the kids really enjoyed learning with their candy hearts and sneaking a few to eat from time to time. Once you're done you could try any of these other 7 Valentine's Day crafts for toddlers or do some other candy heart projects. For more Valentine's Day ideas check out my Valentine's Day board on Pinterest. I am adding to it daily!